The Regents Armory has a new brick and mortar location on our campus! Come visit us for the grand opening tomorrow and stock up on all your Regents fan gear. The Regents Armory is located next to the concession stand by the gym. Dominique Simmons is a Physical Education Teacher, Head Girls Varsity Coach, and Girls Basketball Program Director. Previously Dom served as a part-time JV Head and Varsity Assistant coach. Dom completed her undergraduate studies at Simpson University (B.A. Psychology) and played collegiate basketball. Dom went on to complete her graduate studies at Liberty University (M.A. in Counseling & Life Coaching and Doctorate Educational Leadership). Dom relocated to Texas after playing professional basketball overseas. In her free time, she enjoys playing in the Women’s D-League, strength training, reading books on personal and professional development, writing poetry, and developing Life Coaching videos and curriculum. She enjoys being at Regents because she able to mentor and empower others, be challenged, learn new things, and most importantly grow as a woman of God. "Yesterday, we celebrated the commitments of five student-athletes extending their athletic and academic careers.We celebrated five families that contributed greatly to their success.We celebrated a community of coaches, teachers and friends who all rallied together to support these student-athletes in their athletic and academic achievements." Celebrating a common identity around Christ, the day was full of round robin games with teams made up of girls from all three schools, "get to know you" exercises, and sharing a meal together. We are so proud of our Knights Cheer for winning 3rd place at the TAPPS State Competition. Watch some of their routine here! During each halftime of our Varsity Boys and Varsity Girls Soccer games against Hyde Park, students had the chance to score a goal on Head of School, Dr. Dan Peterson. Check out the videos! 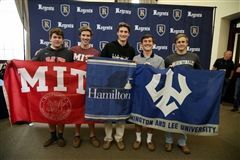 Check out the Austin-American Statesman article "Faces off the Field: Hunter Walker, senior midfielder, Regents"